I lived for several years on Scituate Street in Arlington Massachusetts. It was a lower middle class neighborhood of traditional working-class families - blue collar workers, police officers, nurses and school teachers. The neighborhood families were largely from Irish backgrounds with a smattering of Italians and one Jewish family. Most of the kids went to Catholic schools. The street is still used for ad-hoc basketball and stick hockey games. I snapped a photo of the street the day after the 9-11 World Trade Center attack, and, as you can see here, every single house was flying a US flag. 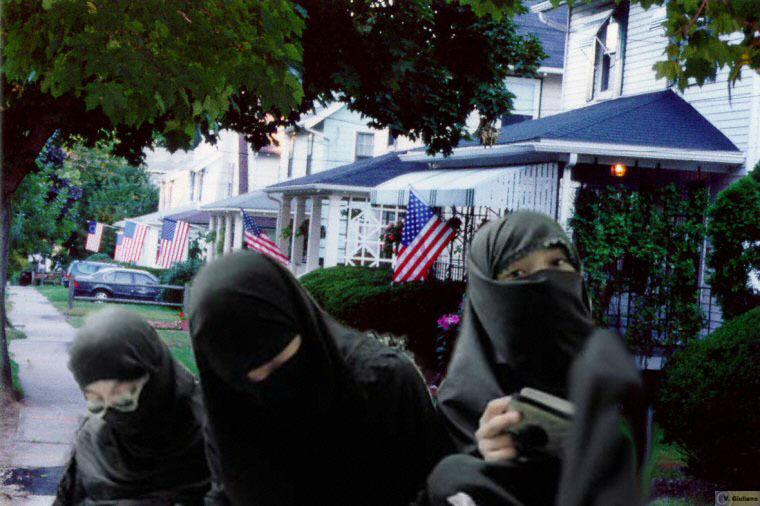 The montage is my idea, showing a throng of devoted Islamic women bustling through this neighborhood of flags. One of the questions I wanted to raise is: What are the limits of the American experience? Is this still Americana? I find myself making more and more social-commentary art pieces as time goes on.